The ultimate aim of any IT Service Desk is to efficiently and cost effectively deliver solutions to technical issues raised by users and the business. Whilst the technical fix is the goal, the customer experience is of equal importance and can make or break an IT department’s credibility and reputation. We all know how it feels to receive great or poor service, yet can all too often underestimate or overlook the importance of it when dealing with our own internal customers - especially when things are going wrong. The resulting costs can be quite significant! 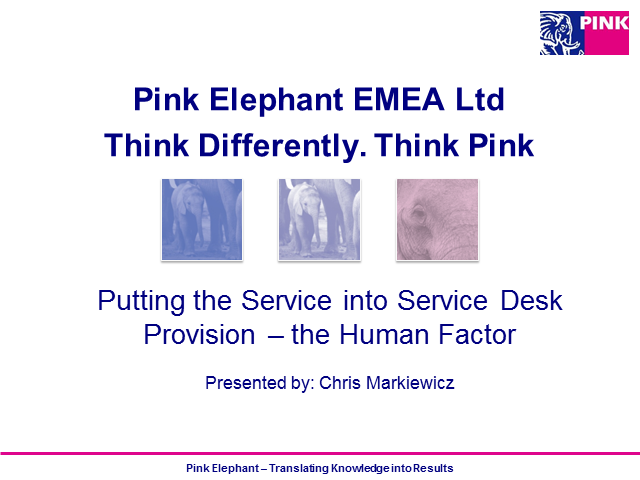 In this fascinating webinar Chris Markiewicz explores how to develop and apply some of the key “human” factors that help ensure your Service Desk team consistently provide great service, alongside that all important technical fix - not because they have to, but because they want to.